Enterprises should find it easier to tap the benefits of FPGAs now that Dell EMC and Fujitsu are putting Intel Arria 10 GX Programmable Acceleration Cards into off-the-shelf servers for the data center. Beginning this week, Dell will make programmable acceleration cards with Intel Arria 10 GX FPGAs generally available in the PowerEdge R640, R740 and R740XD servers, and Fujitsu will give priority customers early access to Primergy RX2540 M4 servers with the cards installed. The FPGAs are designed to work with Intel Xeon processors to meet specific data-intensive performance requirements within a workload. It's something of a milestone, since up to now, FPGAs, or field-programmable gate arrays, have not been widely available as an option in servers targeted at corporate data centers. "This is all part of a larger strategy to make the adoption of and accessibility to FPGA-based acceleration to a broader set of users," said Reynette Au, vice president for Programmable Solutions Group marketing at Intel. FPGAs can be programmed, after manufacturing, to act as custom accelerators for a variety of workloads, and they are increasingly being used in areas like machine learning, specialized financial applications, video transcoding and genomics -- workloads that benefit from parallel processing. Not incidentally, these workloads are related to markets that are seeing an explosion of data and, for companies that can exploit that data, are increasingly lucrative. GPUs, which also do parallel processing, are used for these workloads as well. FPGAs though, can be completely customized for specific workloads. They have the added benefit of allowing developers to turn off gates that are not being used, thereby drawing the least amount of power needed for a specific task. FPGAs have mainly been used by government and scientific institutions as well as giant manufacturers and tech companies like Microsoft, which have special data-heavy processing requirements or simply enough market clout and cash to warrant the use of custom servers with built-in accelerators. FPGAs have also posed a steep learning curve for programmers. Customizing FPGAs was done for years via Hardware Description Languages (HDLs), rather than the higher-level languages used for other chips. "The reason why it's taken a long time for these FPGAs to become more mainstream is that they’re are harder to program than a CPU and the tools aren’t as mature as they are for GPUs," said Patrick Moorhead, founder of Moor Insights and Strategy. But FPGA makers in recent years have invested in building up software stacks to complement the chips. For the Arria 10 GX cards, Intel has made available, for example, the Intel FPGA SDK for OpenCL, the Quartus Prime Pro Edition software and the Acceleration Stack for Intel Xeon CPU with FPGAs. "We're addressing specifically the large software development community by creating a software stack and extracting the challenges of programming an FPGA," said Intel's Au. "We feel that we've lowered the barrier to adopting FPGAs for high volume mainstream applications." Nevertheless, developers still need more specific expertise to program FPGAs than they do for CPUs. To spur adoption by enterprises that may not have in-house expertise, Intel has worked with third parties who have prebuilt software acceleration stacks for particular workloads. 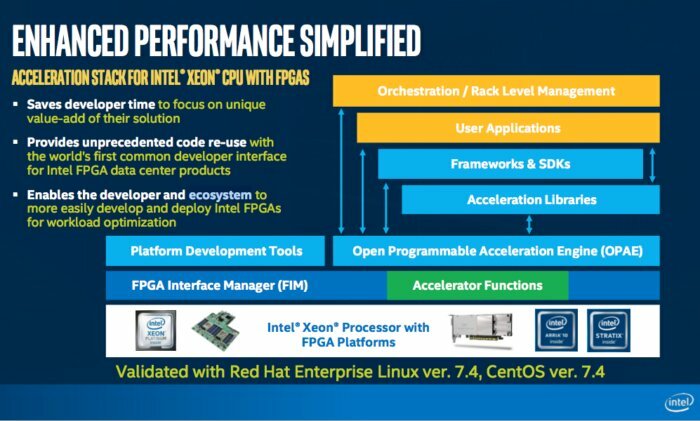 With the release of the acceleration cards for the Fujitsu and Dell servers, Intel is highlighting some of the work its developer partners have done. For example, Levyx, which builds big data applications, reports that it has sped up securities options trading simulations by more than two times using the Dell R640 server with Arria 10 FX FPGAs cards on the CentOS 7.4 OS, as compared to traditional Spark implementations. Swarm64, which builds relational database systems, is also using the Dell R640 server with Arria 10 GX FPGAs on the CentOS 7.4 OS to speed up data analytics, though its implementation uses a different Xeon CPU than the system tested by Levyx. The Fujitsu and Dell servers wth the Arria 10 GX cards have been validated for Red Hat Enterprise Linux 7.4 as well as CentOS 7.4. Intel acquired the Arria FPGA line when it bought Altera in December 2015 for $16.7 billion. The Altera team also developed the newer Stratix FPGA line, among other products. 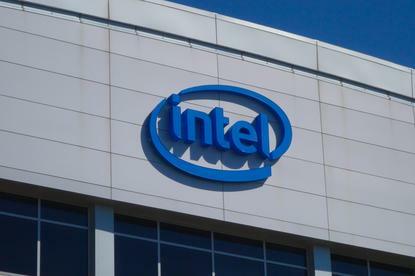 Intel has indicated it will come out with Stratix cards for enterprise servers in the future. Stratix 10 is manufactured on Intel’s 14nm Tri-Gate process, while the Arria 10 (as well as the Cyclone 10) are made on TSMC's 20nm planar process. Altera rival Xilinx has also been building up the software stack for its own FPGA product families, and recently announced what it calls a new category of programmable chip – the Adaptive Compute Acceleration Platform (ACAP). It says that developers can work with ACAPS using standard tools like C/C++, OpenCL, and Python. Ultimately, in making a decision whether FPGAs or GPUs are suitable for a particular task, or whether Intel or Xilinx FPGAs are the right choice, systems engineers will look carefully at the available software tools for the workloads they have to deal with. For a given workload, any of these products are potential winners, says Moorhead: "To me, it’s a race to see who can build out one of the biggest ecosystems the quickest." Pricing for the Dell PowerEdge servers generally starts in the $2,000 range and goes up, depending on configuration. Fujitsu server prices are offered on request.